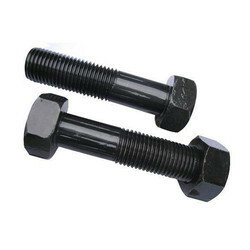 Being a customer oriented organization, we are deeply engaged in offering a wide array of MS Hex Bolt. By using advance technology, we are involved in manufacturing and supplying a wide assortment of MS Hex Bolt. 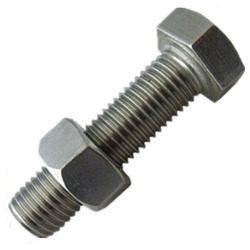 This MS Hex Bolt is extensively used in various suitable applications and available in the market in various sizes. The offered MS Hex Bolt is widely used in automotive and engineering industries for fastening. We have a wide range of Mild Steel Nut Bolt and Stud. We offer Golden Plated Hex Bolts to our clients. SIZE RANGE M 8 - M 64, L= 10 - 400 TO IS : 1364 / BS : 1768 / BS : 1769 ASTM 193 / B 7, B 8 IN PROP. CLASS - 4.6/4.8/6.8/8.8/10.9/12.9, AI-50, 70, CI - 50, 70 GR. S, T, U, V, W, GR. 5, 8. Hex Bolt & Nut Hot Forge-size - 1/2" 5/8 , 16mm, 20mm or 4 suta, 5suta , Length- 8" to 22"
Quantity Per Pack: 50 Kgs. Hex Bolts made from Mild Steel by Hot or Cold forming process.